It’s becoming abundantly clear that Theresa May and her merry Brexiteers have rather strange ideas about what the country needs to get out of Brexit (innovative biscuits, anyone?) and how to get Brussels to agree to a good deal. I’ve been somewhat puzzled by the reasons for this, but recently several article and comments have converged to create a clearer picture in my head. I’ll be quoting several of these below. [P]olitically minded public schoolboys inhabited their own Oxford bubble. 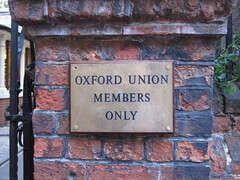 […] Their favourite hang-out was the Oxford Union, a kind of children’s parliament that organises witty debates. […] It’s no coincidence that the Houses of Parliament look like a massive great Gothic public school. That building is a magnet for this set. Whereas ordinary Britons learn almost no history at school except a UK-centric take on the second world war (as evidenced in the Brexit debate), the Union hacks spent their school years imbibing British parliamentary history. Their heroes were great parliamentarians such as Palmerston, Gladstone and Churchill. I don’t think most Union hacks dreamed of making policy. Rather, Westminster was simply the sort of public-school club where they felt at home […] [When] Margaret Thatcher gave her legendary anti-European “Bruges speech”, […] this set began obsessing about Brussels. Ruling Britain was their prerogative; they didn’t want outsiders muscling in. Tory “Euroscepticism” is in part a jobs protection scheme akin to Parisian taxi drivers opposing Uber. The public schoolboys spent decades trying to get British voters angry about the EU. This explains amongst many other things why the Brexiteers keep going on about free trade, not realising that today businesses are more interested in not getting their just-in-time supply chains interrupted by customs officials — they have spent too much time reliving the free trade debates of the 19th century. Something I observed when seconded into Whitehall from the EU was how the Bubble (Westminster and Whitehall) does not ‘get’ the EU Institutions, to the point that it seems almost wilful. What do I mean by this? I mean that Whitehall — even UKREP veterans — deploy almost all of their resources in lobbying other members of the Council while ignoring the other institutions, the Commission and Parliament. London seems to think that building alliances with other capitals is the only way to get things done in Brussels. It almost felt like wishful thinking on their part — “we want it to be intergovernmental so we’re going to pretend that it’s intergovernmental”. Yes, the Council is the most powerful of the EU institutions and yes Member State positioning counts but not exclusively so. As much as Whitehall would like to pretend that Berlin and Paris will be conducting these negotiations, they won’t be. London will have to deal with the Commission. And boy it is not going to be an easy ride. The Commission are very used to tough negotiating on behalf of EU citizens and EU Member States. This is really shocking, but it explains why David Cameron approached his renegotiation in entirely the wrong way by talking almost exclusively to the other heads of state. I think this ties in with the first article I quoted above. The Brexiteer Tories spent their school days studying Westminster debates of the 19th century, so of course they want to revert to the foreign politics of that era, too. I think, ironically, English political leaders have the same thing in reverse with Scotland — a kind of projection. I’m pretty sure none of the sane ones really wanted (or want) Brexit. They just want to blackmail the EU into giving them what they want with the threat of leaving. So with Scotland and the SNP, they assume Salmond, Sturgeon et al are doing the same thing, ie they don’t really want independence, just to force more concessions out of the UK. They view both as games of poker where you “don’t show your hand” to the EU, and “don’t back down” with the Jocks — just tell them what’s what. There’s a real and horrible danger for England there that they end up out the EU on their own because they’ve mis-read both situations and assumed everyone plays daft political games the way Westminster does. So basically, they don’t just have strange and old-fashioned ideas about how politics should be done, but they assume everybody is the same. [In Germany] when somebody offers you something to eat, and you want it, you say “Yes”, not “No.” These well-brought up [British exchange student] ladies would usually say, “Oh no, I couldn’t possibly eat a biscuit” the first time around and wait to be persuaded before giving in with a genteel, “Oh, go on then.” In Germany, [their teacher explained], “No” actually means “No.” You won’t be offered that biscuit again. And last week to Theresa May in Brussels, the answer was “No.” She’s not quite sure how to make this any clearer. But in the UK, poiticians and journalists are asking the question, “What does Merkel really think?” The chatter in Westminster is all about how Britain can persuade Germany to give it the best bits of the single market and amidst all the talk of red lines and not revealing your hand, there is continuous speculation about how to interpret the signals coming out of Berlin. In fact, this is all quite simple. Merkel means what she says, and German politicians are getting increasingly frustrated by London not seeming to understand this. Interestingly, several people pointed out on Facebook that this is perhaps only a problem for the southern English middle classes — a Scot doesn’t typically have any issues with understanding what the continental politicians are saying. It’s very worrying, though, because it means the Brexiteers will waste everybody’s time in the negotiations. In short, they’ll speak to the wrong people, in the wrong way, asking for the wrong things, and they won’t understand the reply. Wow. ← Do we know what worked and what will work? I Think you are spot on with this.The English really don’t get it.Having just returned from Austria the people there are confused,they cant see why the UK should leave the EU and don’t see why the UK thinks it can cherry pick from the table.To them out is out. I too believe David Cameron got it wrong on tactics. The presumption of Westminster and Whitehall is that the UK (England) has been indispensable to the democratic progress in the EU – ancient mother of parliaments, habius corpus, Magna Carta etc. The reality is that the EU is far more democratic than the UK with its monarchic privilege, its House of Lords, its focus on Oxbridge. Cameron’s mindset was that only Germany and France were important in the scheme of things, forgetting that each and every country has an equal vote and each and every country has an equal shot at the presidency. Indeed the current set-up has a Luxenburgian and a Pole as heads of two legs of the stool. So this Brexit is all about hubris. John Redmond and David Davis ooze with it and they are in for a shock as the rest of the world laughs up its sleeve at them. I think there is a third factor and that is the make up of the British Parliament and the philosophy that it espouses. We have the House of Commons which is based on the FTP system and the unelected House of Lords which is filled primarily by the “winning” party from the House of Commons. This encourages a “winner takes all” mindset where the objective is to crush the opposition into the ground. True co-operative coalitions are not possible in such a system. This was a lesson the Lib-Dems learned to their cost in the last parliament. For a politician from Westminster background of “winner takes all”, the EU philosophy of reaching decisions by consensus is an anathema. Inevitably EU processes involve compromises on the part of many, if not all, member states. In Westminster political circles, compromise is equated with failure, whereas in the EU institutions, an agreement based on consensus albeit with many compromises is regarded as a success. There is a major conflict of philosophies here. I suspect that the EU is finding that reaching consensus is a whole lot easier without the UK/Westminster constantly demanding special treatment. They may be more than willing to forego what the UK contributes if it means better cohesion within the EU. I think that the refusal to participate in any pre-negotiations was exactly the right tack for the EU Commissioners to take. I do read some quite right wing anti-EU pro-Brexit sites. I could be wrong, but I seem to detect a growing bewilderment at how the member states are not succumbing to UK blandishments and how the EU Commission has maintained its stance on the four freedoms and has not crumbled under the UK demands for special deals. Indeed on some sites I have noticed almost an attitude of petulance that this should be the situation in which the UK finds itself. I do not know what the outcome of all will be, but it will be interesting. The whole concept of Brexit, pushed by the Tory Oxford debating society attitude is, they want their cake and devour it so that nobody else gets a bit. The whole demise of Brexit will be the anchor tied around the necks of those who push it through to the end. The UK will sink under the strain, the EU may compromise on certain issues, but these issues won’t be for the benefit of the UK. There will be hard and extremely difficult negotiations ahead after May invokes article 50. It won’t be the winner takes all in these negotiations, it’ll be Westminster loses all and everything they wanted from Brexit. Westminster Tory’s wanted their so called Sovereignty back under their own roof, but they haven’t taken into consideration that the Jocks too want their Sovereignty back. Scotland will leave the UK and take their oil with them, Westminster’s balance of payments will be up in the air, with no oil to back up their debt, they will end up with a serious financial deficit where the IMF in which Westminster seem to have forgotten about in the melee over Brexit, will fall like a massive hammer on the Treasury where Bankruptcy will loom over them, especially when they struggle to meet their balance of payments on the £1.68Trillion of debt along with no resources to back up their loss of Scotland. Westminster will of course try to get this debt shared out among the worlds governments but I can’t see in the climate where it was Brexit that placed a lot of governments in jeopardy that they too will be reluctant and not very forthcoming with any solution. Westminster will have no alternative but to join the queue along with the likes of Greece. Brexit is the final nail in the Empire that fell by a self inflicted fatal wound. Brexit !